The rotator cuff is a group of muscles and tendons that keep your arm bone in the shoulder socket. If these tissues get damaged you’ll experience some pain and discomfort and will probably need medical attention. You may also need to wear a shoulder brace to protect and support the rotator cuff while it heals. The rotator cuff can get injured in various ways and many people who play sports have damaged their rotator cuff. Twisting the arm, lifting too much weight and heavy contacts can all damage the muscles and tendons. After tearing the muscles in my upper arm a few years ago my doctor told me to wear a shoulder brace. The brace definitely helped in my recovery and it alleviated some of the pain I was in. A study was carried out that concluded it was beneficial to use a shoulder brace when injured. Shoulder brace for left or right arm. Who Needs to Use a Shoulder Brace for Rotator Cuff? When you’ve sustained a rotator cuff injury you’ll probably need to wear a shoulder brace until your injury has healed. Supporting your upper arm and shoulder muscles will help to relieve some of the pain associated with the injury. Many doctors and physiotherapists will tell patients to wear a shoulder brace when the rotator cuff has been damaged. You may also need to use a shoulder brace following rotator cuff surgery until you’ve fully recovered. Your upper arm and shoulder will be quite sore following the operation and a brace will help. A brace may also help to heal a shoulder injury so that you don’t need to have a surgical procedure carried out. You can also use a shoulder brace when your injury has healed to protect your shoulder against further injury. If you’re playing sports or doing manual labor you need to look after the shoulder that was injured. Although you may no longer be in pain, the area that was injured could still be weak. How Does a Shoulder Brace for Rotator Cuff Work? A shoulder brace is a basic device that provides support for the upper arm and shoulder following an injury or surgery. There’s a cuff that fits around the upper arm and shoulder which gives a snug fit. There’s also a securing strap that passes around the chest and back as well as an adjustment strap. Due to the fact that shoulder braces are a snug fit they help to heal damaged muscles and tendons. The snug fit provides some compression which will encourage blood flow to the injured tissue. When muscles and tendons are getting an adequate supply of blood they’ll heal quicker. A shoulder brace can also immobilize your upper arm so that it doesn’t move around in the shoulder socket. Keeping the upper arm immobilized will help the rotator cuff heal and prevent further damage. The amount of immobilization will depend on the type of brace used and how tight it is. 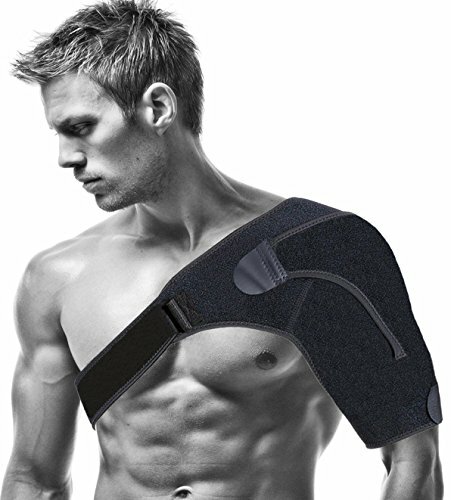 A shoulder brace can also be used to build muscle mass following an injury or surgery. If your shoulder has been out of action for a period of time the muscles will need to be built up. The resistance provided by a brace will make the muscles work harder which helps to build them back up. How Do I Choose a Shoulder Brace for Rotator Cuff? It’s very important that your shoulder brace fits you properly and it should also be comfortable. A shoulder brace that’s too big or small won’t be effective and your injury may not heal properly. When a shoulder brace is fitted it should be a snug fit so that it stays in place. Make sure you buy a shoulder brace that’s suitable for the shoulder that needs to be supported. Many braces will fit both left or right shoulder and some are designed to fit only right or only left. You should buy a shoulder brace that’s adjustable so that you can fit it in the correct position. Most of the shoulder braces have an adjustable strap so your upper arm can be positioned correctly. Use a brace that has a good-quality buckle or Velcro fasteners so the strap stays securely fastened. Purchase a shoulder brace made from high-quality materials for longevity. A brace that’s been poorly made or one with low-quality stitching isn’t going to be durable and you’ll probably have to replace it. The fabric should be thick enough to provide support for the shoulder without being so thick that it’s uncomfortable. If you’re going to be wearing your shoulder brace for long periods of time you should use one made from breathable materials. Breathable fabric will help to minimize perspiration and your upper arm will be cooler. Excessive sweating could lead to rashes or other skin conditions. If your doctor or physiotherapist has told you to administer cold therapy you should look for a shoulder brace with a pouch that can hold an ice pack. Cold therapy is often used to treat rotator cuff injuries and having an ice pack in the brace may be beneficial. Using this type of shoulder brace means you won’t have to take it off to administer cold therapy. If you plan to wear your shoulder brace underneath clothing you should choose one that’s lightweight. A lightweight brace will be more comfortable and less visible underneath a shirt or sweater. It’s worth noting that you may need to try a few shoulder braces before you find one you’re happy with. A brace that works for one person may be unsuitable for another. Buy a shoulder brace that fits properly. Buy a brace that’s easy to adjust. Use a brace that’s comfortable. Buy a shoulder brace that’s well made. Use a brace made from breathable fabric. What Is the Best Shoulder Brace for Rotator Cuff? We’ve looked at a selection of shoulder braces that are suitable for supporting the rotator cuff. When reviewing each brace we looked at price, quality and the materials used to make the brace. We also looked at the support provided by the shoulder braces and have listed some pros and cons for each one. The shoulder stability brace made by Babo Care offers adequate support for the rotator cuff and its available in two colors. The shoulder brace has an adjustable strap that’s fitted with a plastic buckle as well as Velcro fasteners. The good-quality neoprene material is breathable making this brace comfortable and cool to wear. Customers who purchased this brace said that it provided the support and stability that they needed following an injury. Users said that their pain levels were significantly reduced when wearing the shoulder brace and others also said that this shoulder brace is durable and easy to keep clean. People who purchased this shoulder brace have said it lost some of its elasticity after a few days of use. Others reported that the shoulder brace kept slipping because they couldn’t get it tight enough around their upper arm. A few customers have said that the neoprene has a very unpleasant odour. This shoulder brace support by Vistery is suitable for rotator cuff injuries and it provides adequate support for the shoulder. The neoprene brace can be secured and adjusted with Velcro straps to get a snug fit. A great feature on this shoulder brace is the pocket that can accommodate an ice pack for cold therapy. Users of this shoulder brace said it’s comfortable to wear and provides the support they need. Customers also said that the level of adjustment on the brace was much better than with others they’d used. Others were impressed with the high-quality materials used to make the brace. Some customers commented that it’s too small and they would’ve liked more size options. People also said that the fabric used to make the brace was too thick and they couldn’t benefit from cold therapy. A few customers reported that the shoulder brace irritated their armpit. 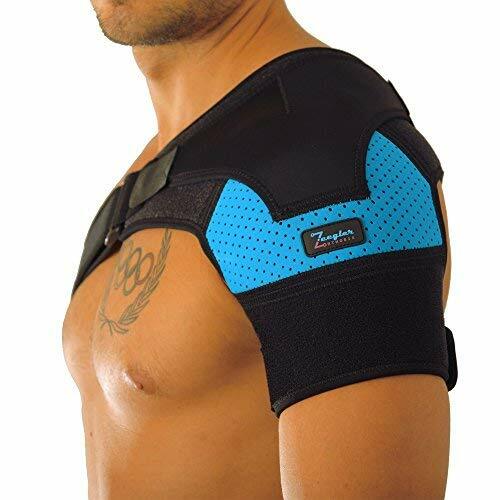 This unisex Zenkeyz shoulder brace offers a good level of support for the shoulder when treating a rotator cuff injury. The brace is made from breathable neoprene fabric and is secured and adjusted with Velcro fastening straps. This brace is supplied with a free overhead pulley which you may find useful for exercising your shoulder during your recovery. 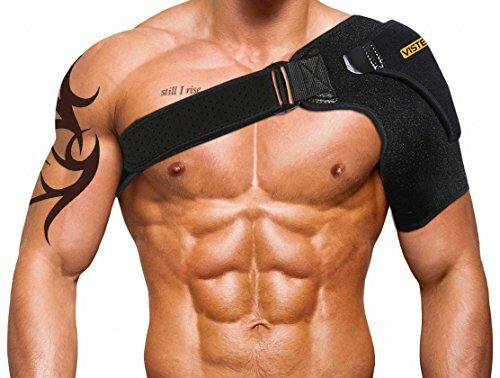 Customers who used this shoulder brace like the fact that it’s easy to put on and take off without assistance. People also commented that the brace fits well and helps to alleviate some of the pain associated with their shoulder injury. 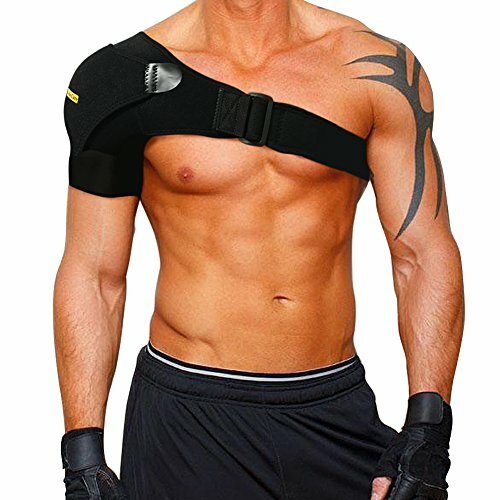 Some customers said that this shoulder brace is well made and durable. 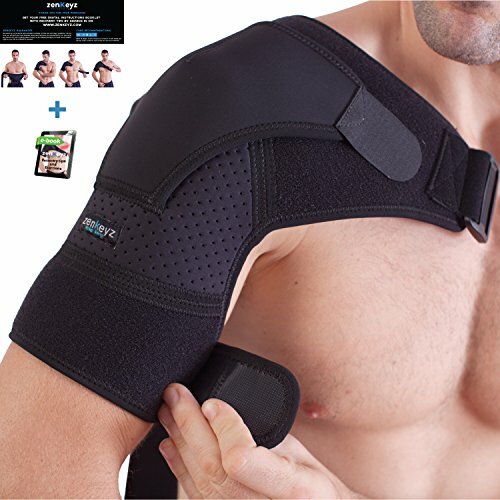 Other people who purchased this shoulder brace said that it had a strong chemical odour when it was brand new and said the brace tends to bunch up underneath their armpit. Some customers reported that the shoulder brace didn’t give them the support they were looking for. The shoulder support brace by Zeegler Orthosis is suitable for supporting either the left or right shoulder. The brace is fully adjustable for a comfortable fit and is secured with Velcro straps. This shoulder brace is made with perforated neoprene which is breathable to keep the upper arm and shoulder cool. Users reported that it provides adequate support and relieved some of their pain. Customers also said that the brace is well made and the perforated fabric is soft against the skin. Some users liked the fact that the brace is easy to put on and adjust. Customers who purchased this shoulder brace have said that it has a strong odour even after repeated washing. Other customers would’ve liked the Velcro fasteners to be stronger. Customers also said they would’ve liked more padding on the strap to make the brace more comfortable. This Wisewife shoulder brace can be used to support the left or right shoulder following a rotator cuff injury. The shoulder brace is adjustable and the strap has Velcro and plastic buckle fasteners. The lightweight neoprene fabric is breathable and there’s also a pocket that can hold a cold pack. Customers who used this brace said that it gave them the type of support they were looking for after a rotator cuff injury. People also said this brace is very comfortable to wear and easy to adjust. Customers like that fact that this lightweight shoulder brace can be worn under clothing unlike other braces they’d used. Other customers commented that the straps on this shoulder brace broke after only a couple of uses and they had to return it. A few people also said that the fastening strap was a little too thin and it dug into their skin. Some customers reported that the shoulder brace was difficult to put on without assistance. All of the shoulder braces we reviewed offer a good level of support for the shoulder following rotator cuff injuries. The shoulder braces that we looked at are all similarly designed and reasonably priced. After comparing all of the products the best shoulder brace for rotator cuff is the Babo Care Shoulder Stability Brace. This shoulder brace provides adequate support for the rotator cuff and is comfortable to wear. The good-quality neoprene material is soft, breathable and very easy to keep clean. The levels of adjustment on this brace were also excellent making the brace suitable for other types of shoulder injury.